Home > EVENTS > Earth Fest 2017! Celebrate Spring with The Children’s Museum of the Treasure Coast! 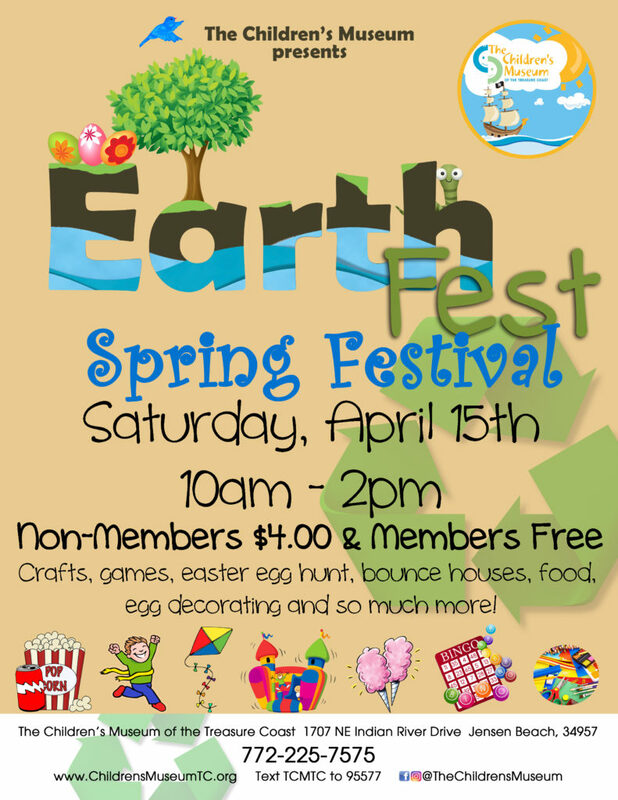 On Saturday, April 15th, from 10AM-2PM, The Children’s Museum will be hosting their annual Earth Fest, to celebrate Spring and our beautiful planet, while teaching childrens and their families to reduce, reuse, recycle. Children will be able to make crafts from recycled materials, play “Recycle” Bingo and go on a super fun Easter egg hunt! Many more exciting activities will be provided by the museum, along with the always awesome museum play. Admission for the event is only $4 per person and museum members are free! The Children’s Museum of the Treasure Coast is located at 1707 NE Indian River Drive in Jensen Beach at the center of Indian Riverside Park. The museum is a great place for children to explore, learn, and play through interactive activities and imagination. For more information, please call 772-225-7575 or visit www.ChildrensMuseumTC.org.